The Owenmore River in Kerry is one of the most unspoilt fisheries in Western Europe in a truly spectacular location on the Dingle Peninsula, comprising an entire river from source to sea. While fly fishing in Kerry you will enjoy this unique and unspoilt area consisting of the entire Owenmore River from its source high on the eastern slopes of Mount Brandon down to the wonderful sandy estuary of Brandon Bay on the Kerry peninsula. The river itself is a spate river draining nine lakes and a 17 square mile catchment area while the fishery is renowned for fly fishing in Ireland with its wonderful supply of salmon, grilse, brown trout and sea trout in its holding pools and lakes. This wild and beautifully scenic spot in Kerry is surrounded by bog and mountains and remains wholly unspoilt by development. 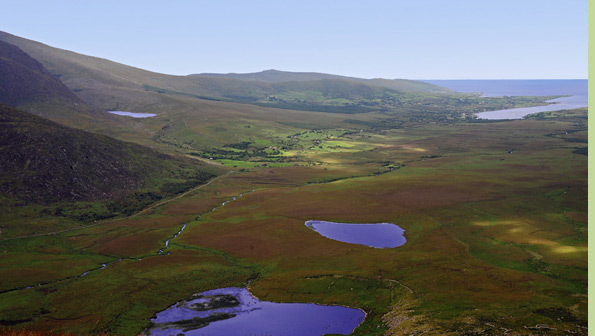 The geographical features of Owenmore are quite unique with two unusual corrie lakes and Mount Brandon (the second highest mountain in Ireland), where the glacial ice was once 800 feet deep. A truly unique destination for fly fishing in Ireland. There are approximately five miles of fly fishing along the main part of the Owenmore River in Kerry, with 33 named pools and an additional 180 acres of lake fishing in this Kerry beauty spot. The salmon, grilse and sea trout begin to run in April. The runs continue through spring and summer into early October. The major valley bottom lakes are visited by both Atlantic salmon and sea trout. These migrating fish spend the summer and autumn months in the lakes before their winter spawning period. The higher lakes are populated by resident brown trout, with Arctic char also reported. All the fish in the Owenmore system are wild stock and the fishery is entirely self-sustaining. "After five minutes I had my first Owenmore trout"
I got a phone call recently from Frank Maunsell, the fishery manager of the Owenmore Fishery in Clahane, Co Kerry, looking for a specific salmon fly rod. After doing a deal with Frank, the conversation inevitably turned to fishing. He proceeded to tell me about the numbers of salmon that were running into the system after the floods and then he added "Plenty of sea trout are coming in off every tide as well." Hold it! Reverse! Did you say "sea trout"? I had often heard about the fishery, but never fished it. Frank then uttered those magic words: "Why don't you come down for a day's fishing and drop in my double-handed rod?" We didnt get as much rain as forecast but there is still a nice flood in the River. The flood will only last a day or two because the rest of the week is forecast to get warm and dy. This flood brought in a good run of seatrout of 4 to 5 lbs weight. I also saw some salmon and one is at least 10 lbs in weight. Anti-Spam Question: What is 20 plus 10?